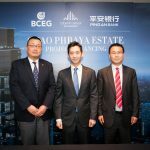 Leading Bangkok-based international real estate developer, Country Group Development, the real estate development and investment arm of Country Group has secured project financing through China Ping An Bank and will continue on schedule with the development of the luxury mixed-use Chao Phraya Estate. “Country Group Development is pleased to announce this financing agreement with such a well respected financial institution. The structure aligns perfectly with our business targets as we move ahead with the construction of all three phases of the Chao Phraya Estate. We are confident that our unique combination of Four Seasons Private Residences, Four Seasons Hotel and Capella Hotel will set a new quality benchmark for mixed use developments globally,” said CEO and Director of Country Group Development, Ben Taechaubol. The agreement will effectively raise up to USD 375 million to ensure the timely, successful completion of the Chao Phraya Estate to the highest specifications. The financing will be managed through Landmark Holdings Company Limited, a joint venture between Country Group Development and BCEG Thai International Co., Ltd that was updated in May of this year. Beijing Construction Engineering Group (BCEG) was founded in 1953 and has successfully maintained a leading position in the construction industry in China while also expanding its global presence. The company is ranked as one of the world’s top 50 contractors by revenue and employs some 20,000 people around the globe with branches and field offices in more than 20 countries. BCEG’s portfolio of completed projects covers over 130 million cumulative square metres and the Group’s landmark developments in China include 29 Olympic venues, the New Hainan Airline Tower, the gymnasium at Beijing University of Technology and the National Convention Center. Internationally, the BCEG has undertaken Al Reem Island Development-Phase 1 in Abu Dhabi, the Australian Varsity Lakes Private Hospital Project on the Gold Coast and has been an equity and construction partner in the £800 million Airport City project at Manchester Airport in the UK since 2013. China Ping An Group was formed in 1988 and became China’s first joint-stock insurance enterprise. The company has since diversified to cover all areas of the financial sector and banking, and is listed on the Shanghai Stock Exchange main board as well as the Stock Exchange of Hong Kong. As of December 31, 2015, China Ping An Group’s total assets amounted to 4.77 trillion Yuan and the company ranked No.32 on the Forbes list. The company boasts a total internet user base of around 242 million, and its principles are based on the highest standards of corporate governance for shareholders, customers, employees, society and partners. “At China Ping An Group we follow a consistent strategy that is aimed at creating value through win-win co-operation with all stakeholders. We actively pursue sustained and stable development with a unified brand and culture that is firmly based on common goals,” said Mr. Xie Jiong, General Manager, Ping An Bank Company Limited. Structural works on the main tower of The Four Seasons Private Residences at Chao Phraya River are already 100% percent completed from LG to L8 and the entire project is on track to meet a completion target of Q4, 2018. 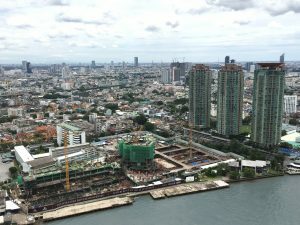 Structural works on the main tower of The Four Seasons Private Residences at Chao Phraya River are already 100% percent completed from LG to L8, with the substructure and foundation works on the other key project components – Capella Hotel and Four Seasons Hotel – either finished or well on the way to completion. The Four Seasons Private Residences Bangkok at Chao Phraya River is part of vision that includes the Four Seasons Hotel Bangkok at Chao Phraya River as well as Capella Hotel Bangkok, each set to take their place as iconic landmarks on the longest waterfront promenade in Bangkok, covering 35-2-68 Rai (approximately 14.2 acres) and 350 meters of river frontage. 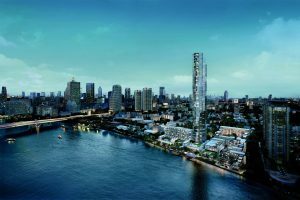 Named in its entirety as The Chao Phraya Estate, the development is Country Group’s largest project to date, valued at 32 billion baht. Four Seasons Residential Sales Gallery is situated on the development site at Soi Charoen Krung, 64 Charoen Krung Road, Yannawa Sathorn. For further information, please visit chaophrayaestate.com.